When TSB wanted to improve their complaints handling training, they brought in the Day One team to create true to life elearning scenarios with ‘eRoleplay’. Positive contact centre experiences require staff to demonstrate effective listening to the customer, a high level of subject matter expertise, empathy, and a fast resolution to the issue. TSB understand this, which is why they brought in Day One to make complaints handling training better using elearning scenarios and peer to peer learning. TSB is Britain’s most recommended high street bank and it’s not hard to see why. As well as being committed to providing products and services of the highest standards, TSB takes extra good care of its customers and takes all complaints VERY seriously. Although it’s not like the British to moan (unless it’s about the weather), comprehensive training for TSB’s call centre staff was essential to ensure that any grumbles were resolved quickly and quietly. TSB wanted a new resolving customer complaints course for its contact centre staff, which would include core topics such as ‘listening to the customer’, and ‘logging the complaint correctly’. In addition, TSB wanted staff to appreciate what it felt like to be the disgruntled/hopping mad customer making the call to improve the way they handled them. Did somebody say roleplay?! Understanding that the very mention of the word ‘roleplay’ strikes fear into the heart of most mortals, Day One set about developing an elearning solution which would be roleplay, but not as we know it. What Day One came up with was a unique eroleplay programme, where delegates join an interactive session and play as either the advisor or the customer. 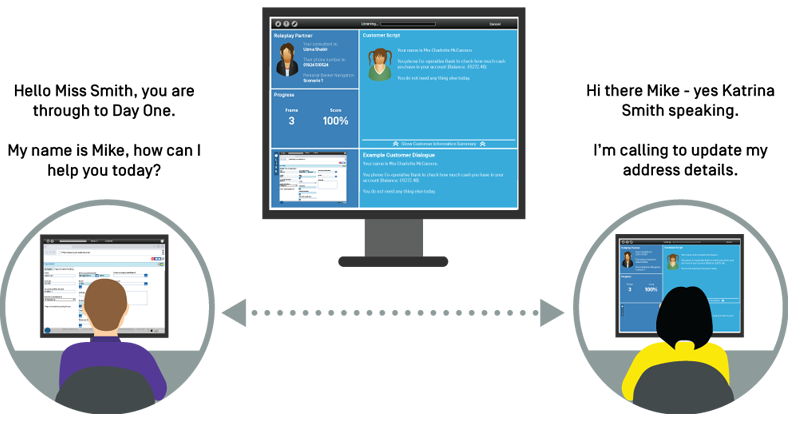 To begin, trainees choose a software avatar for themselves, and enter a virtual lobby where they are paired randomly with another delegate on their course – the two are then connected over the phone, and roleplay can commence. 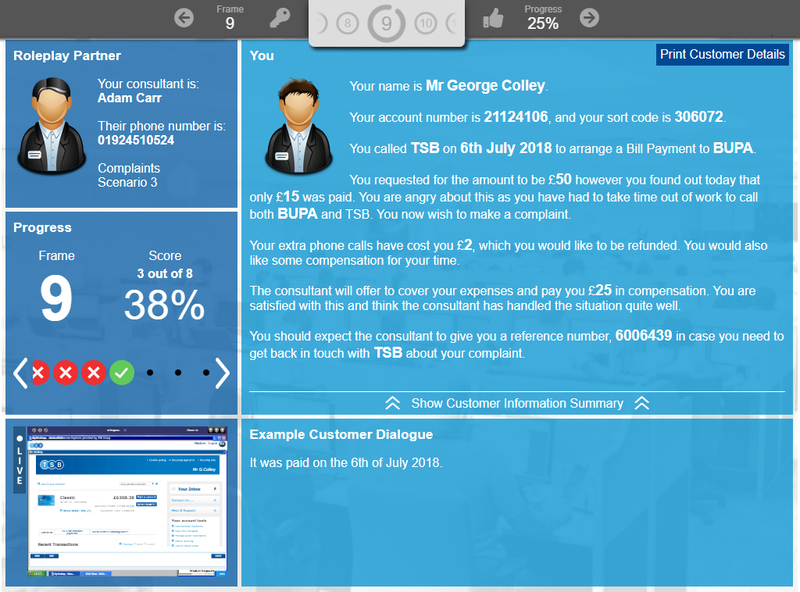 To make it a true-to-life experience for the trainees playing the advisor, Day One created a mirror-image of TSB’s complaint handling software, as well as simulations of other systems they would need to reference to resolve the complaint (such as the one used to access customer account details and transactions). All populated by Day One’s Dynamic Data™ using realistic examples of when, why and how customers complain, the advisor practices their customer service skills by chatting to their caller while investigating and resolving the enquiry. For the trainee playing the customer, the eroleplay provides valuable insight into the experience of the caller. But the best part for both trainees is that there is not a room full of people watching them do it, as everyone is busy doing the same thing which we can all agree is far less embarrassing and takes the awkwardness out of roleplay. TSB loves the ‘learning by doing’ method of training so Day One’s eroleplay solution was right up its street. By giving employees a realistic opportunity to verbalise, listen, empathize, influence and reflect, TSB has significantly improved the quality of its complaint resolution service for even more happy customers. Here are some of the nice things they said about us. Day One can deliver bespoke elearning for complaint handling training or any other skills development needs, using the best in scenario based learning. See how we develop eRoleplay for realistic training scenarios.